Poachers are capitalizing on the disarray in the Central African Republic (CAR) and appear to be moving freely in a search of elephants. Late last year several columns of Sudanese poachers, up to 200 well-armed men, were spotted traveling across northern CAR toward Chad and Cameroon. Reports last week indicate that these poachers are moving back-and-forth between CAR and Chad. In CAR, groups of poachers on horseback or with camels have been reported in the western and southwestern parts of the country, including several locations near Dzangha-Sangha National Park. The poachers are reportedly speaking Arabic and English. At four separate locations, several fresh elephant carcasses were found. These killings may be serving as “tests” to assess the readiness of troops and other anti-poaching forces. Last Wednesday, Project Ecofaune, a program funded by the European Union, reported a massacre of elephants near Mbaéré-Bodingué National Park in southwestern CAR. While details on the numbers killed remain sketchy, this morning Ecofaune noted that a group of 24 Sudanese poachers were in the peripheral zone of the Mbaéré-Bodingué National Park and that 10 men were poaching blithely around Ngotto, less than 40 miles away. Reports indicate that several elephants were injured and that elephants had panicked and taken refuge in and around the village. There are also indications that these poachers are becoming aggressive toward people. 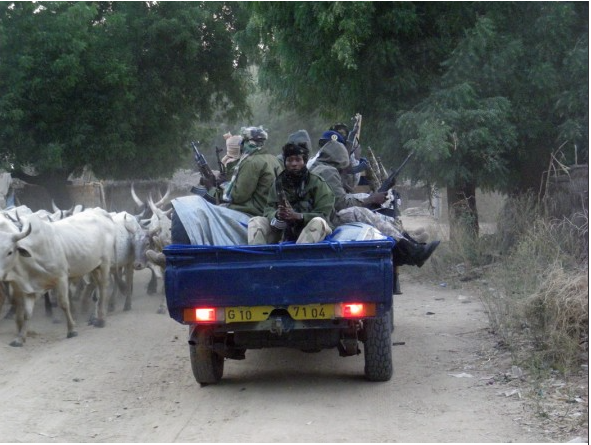 The poachers have also made incursions into Chad. 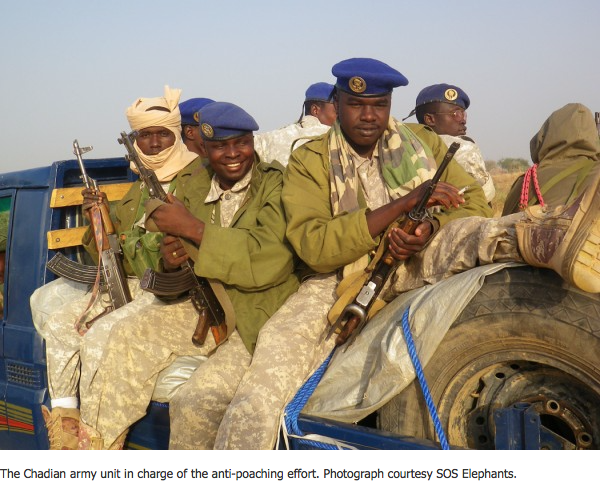 On January 27, a surveillance team from the Chadian non-governmental organization SOS Elephants encountered a group of 40 presumed Sudanese elephant poachers between Baibokum and Bessao in the Logone Oriental region of Chad. Two days later, the team found four fresh elephant carcasses in Monts de Lam (also in Logone Oriental). In both countries it appears villagers are giving intelligence on the elephants’ locations to the poachers in exchange for meat. In Cameroon, the government has deployed its special forces military unit, the Rapid Intervention Battalion (BIR). 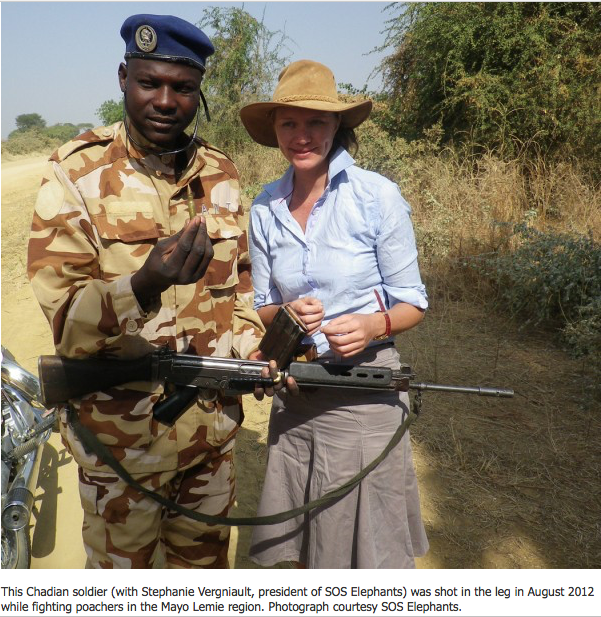 In Chad, the army has been pursuing the poachers and chasing them to the border, according to Stephanie Vergniault, president of SOS Elephants. CAR is one of the poorest countries in the world and has long been plagued by conflict and coups. The government’s capacity to deal with this or any other threat is severely lacking, as was in evidence throughout December 2012 and early January this year when rebel forces, threatening to overthrow the government, captured one-third of the country. Unable to repel the rebels, CAR President Francois Bozizé pleaded for military assistance. Chad’s President Idriss Déby Itno sent forces who were soon joined by troops from other central African countries and South Africa, with France supporting these efforts. The United States temporarily closed its embassy and evacuated its staff because of the security situation. A cease-fire and peace plan were agreed on January 11, with President Bozizé allowed to remain in power until his term ends in 2016 and Nicolas Tiangaye, an opposition lawyer, appointed as prime minister. However, on January 30th the Voice of America reported the rebels had broken the agreement. The political situation remains in flux. Even if the capacity existed, it is unclear if the political will to address poaching is there. According to the Voice of America, after signing the peace deal in January, President Bozizé declared he would “work to strengthen ties with China, and to promote oil exploration and development.” In neighboring Chad, SOS Elephants President Vergniault says the Chinese are largely responsible for promoting the illegal ivory trade, with ivory “smuggled through Chinese nationals working for the China National Petroleum Company” on an oil pipeline project. The situation is similar in Chad. In response to the movement of poachers from Sudan across CAR to the Chad border, last December Déby sent military aircraft to patrol the Mayo-Lemie–Chari Baguirmi regions, where elephant numbers have more than doubled from 300 at the start of 2012 to around 700. Last August Déby launched a massive search that captured five of the poachers responsible for a massacre of 63 elephants in that same area. And this morning five trucks with 100 more soldiers arrived in the Logone region to hunt the poachers. 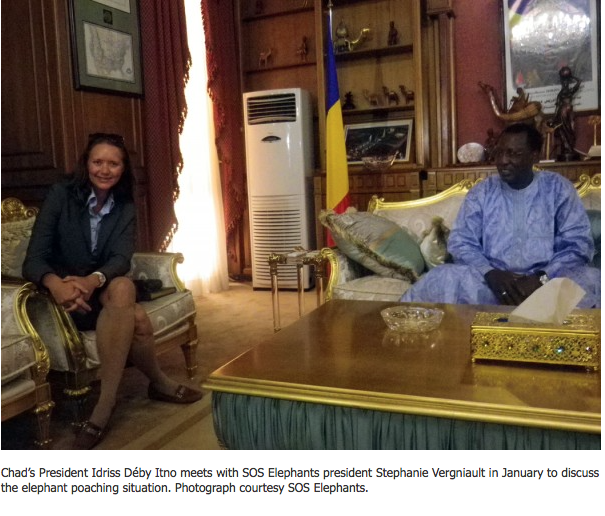 Déby’s personal concern over elephant poaching is well known.